OLYMPIC swim champion Kyle Chalmers wants to become an AFL footballer. It's been a dream of his for a while now but the 100m freestyle king is set to lace up the boots sooner rather than later. In an interview which appears in Stellar magazine Sunday he has made it clear that he will most likely have a tilt at playing AFL after he has another shot at Olympic gold in Tokyo in 2020. The reigning 100m freestyle champion has made it clear he doesn't want to switch to the sport just because of the earning potential in AFL. It is hard to ignore the fact he trains from dawn to dusk funded by a $26,000 grant and still has to live at home with his parents in pursuit of his Olympic dream. The average wage for an AFL footballer? It's $371,000. Mack Horton, another Olympic gold medallist I also interviewed recently, is also in the same predicament as Chalmers - living with his parents and being funded the same amount as Chalmers. 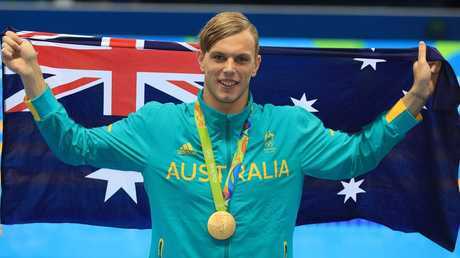 Kyle Chalmers with his Gold Medal after winning the Men’s 100m Freestyle Final at the Rio Olympics. Picture: Alex Coppel. "I can't afford to move out," Horton said. "I live in Melbourne!" It's not breaking news there's little money to be made in the pool these days. In the sport's glory days swimmers like Ian Thorpe and Grant Hackett earned more than $2 million a year. Just days after Stephanie Rice won three gold medals at the 2008 Beijing Olympic Games she signed an $800,000 deal with Channel 7. Those rivers of gold have well and truly dried up. 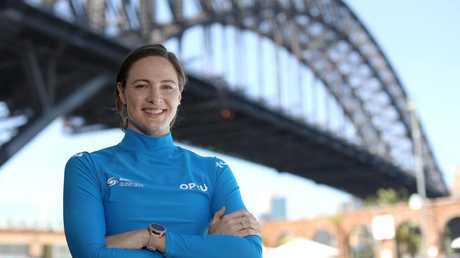 Fellow Olympic champion Cate Campbell this week remarked that very few swimmers these days retire with savings in the bank. The problem starts at the top of the sport. World swimming governing body FINA has been dogged by corruption allegations. They recently threatened to ban swimmers from competing at the 2020 Tokyo Olympics if they join the International Swimming League, a breakaway professional league offering a US$2.1 million prize pool. Campbell didn't hold back this week about FINA and said the sport needed to "evolve with the times." "The world governing body is doing a disservice to the very people that they are supposed to advocate for and protect," Campbell said. "FINA is not supporting us, they are putting swimmers at the bottom of their priority list, they are just lucky that they have a group of extremely passionate athletes who will do anything to represent their country and swim at an Olympic games." Olympic champion and Briton Adam Peaty joined the chorus in criticising FINA's governance. "It feels like we're still in 1970," Peaty told BBC Sport. Konstantin Grigorishin, the financier and brains behind the new league, went further in an interview with The Sunday Times, describing Olympic bureaucrats as "parasites". He said there are "100 times more bureaucrats in Olympic sport than there are in the world of professional, commercialised sport." The Sunday Times calculated the top five Olympic sports, including swimming and track and field are run by around 80,000 bureaucrats, and the revenue is around $4 billion. "The 1000 best athletes, in this case, have an average income from their work of $25,000," the Times wrote. And as the big footy codes and cricket become financially stronger in this country, especially with billion-dollar TV rights deals, the Olympic sports have become weaker. The best emerging athletes are now picking up footy codes and cricket. 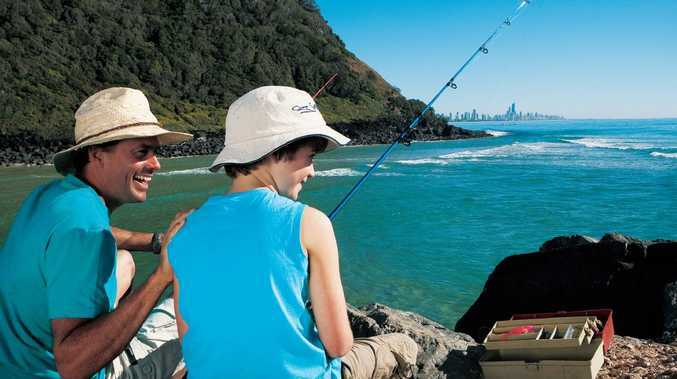 But former Olympic swimmer turned successful businessman Mark Stockwell, the CEO of the Australian Sports Foundation, which supports sports from the grassroots up, says sport should not be about the money. "Where is it written that athletes have to get a career in sport, make all their money and never work again?" Stockwell said. "I want sport to be part of people's lives. For people to be active. It's very therapeutic, it's great to challenge yourself. I had a wonderful opportunity; which is to test yourself against the best athletes in the world on an Olympic stage." "To me, money can't buy that. Has that helped me in my business career? Yes. Has that helped me who I have become today? Yes. How do you put a price on that?" 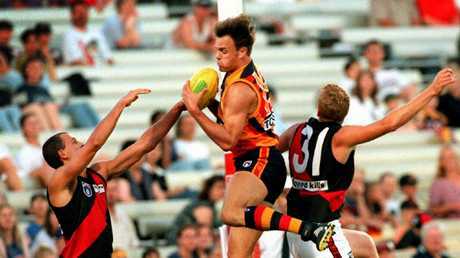 Kyle Chalmers’ father Brett Chalmers takes a mark playing for the Adelaide Crows in the AFL. "I don't sit there and go, 'the poor old athletes aren't making enough money'. I think, 'hang on, we didn't get into it to make money. To some extent, the NRL, the AFL, that's more about entertainment. "What is worrying me is we are becoming a nation of sports watchers and consumers rather than participants in sport." For Chalmers playing AFL would be fulfilling a childhood dream and emulating his dad Brett, who played 75 games for Port Power and Adelaide Crows. The Chalmers family naturally has close ties with Port and it is understood he even formally met with Power chief David Koch and officials several years ago about playing at the top level before the Rio Olympics. "It's something I would love to do and because it is my dream I would give absolutely everything to see if that dream would take off," Chalmers said. "I know how hard it can be to be an athlete in regards to training and commitment. I think I've got that background knowledge in it and if there was a sniff I could play AFL football I'd train all day every day to see if I could get drafted firstly." It is very clear Chalmers is chasing his dream for the love the game.